Sanskrit singer Ranjan Bezbaruah is now all set to conquer the hearts of viewers of Colors TV. 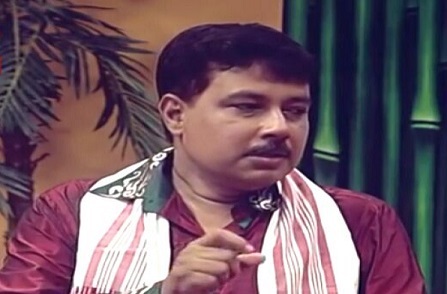 Ranjan Bezbaruah, whose Sanskrit renditions of Bhupen Hazarika’s classics has earned him international acclaim, will be this time singing ‘Gange Vahasi Katham?’, the Sanskrit version of Bhupen Hazarika’s immortal number ‘Bistirna parore’ in the background to a classical dance performance by more than 10 youngsters from Assam. “I was contacted over the phone by someone from Colors TV who identified herself as Matsuri, and from what I understood is that the children would most likely have to perform the Bharat Natyam either to my track playing in the background or to my singing in person. The modalities will be worked out in Kolkata soon, ” Ranjan said. The dance would be choreographed by Guru Elora Bora, who runs Nritya Kalakshetra at Nagaon and Guwahati. She was a student of famous Nritya Kalakshetra, Chennai. ‘Colors knew about my efforts to popularize Sanskrit through the medium of classical and patriotic songs from a YouTube video in which children from all over India had performed a medley of Indian classical dances to my song ‘Gange Vahasi Katham’. It was organised by the Centre for Cultural Resources and Training, New Delhi and the dance had been choreographed by Elora Bora and Malika Kandali in 2010. The young girls would be brought for rehearsals from Nagaon, Guwahati, Raha, Morigaon, Numaligarh and Sivsagar. Ranjan has added another plume to his beret. The versatile singer whose voice bears an uncanny resemblance to the maestro has translated and will be singing A R Rahman’s ‘Vande Mataram’ in Sanskrit in the Vaartavali programme of DD News on Independence Day. Earlier Ranjan had translated and sung ‘Saare Jahan Se Accha Hindustan Hamara’, ‘Ye mere watan ke logon’, and Rabindra Nath Tagores ‘Ekla chalo re’ in Vaartavali, the Sanskrit programme of DDNews. He has also rendered his voice in Md Rafi’s ‘Jahan Dal Dal Par’ translated by Dr H Meher, ‘Bharat Humko Jaan Se Pyara Hain’ by Dr C Ramnagpal from Haryana, ‘Dil hai Chota Sa’ and ‘Vande Mataram’ by Dr Siddhidatri Bharadwaj of Benaras Hindu University. Ranjan has been accompanied by Pronoti Baruah, Krishna and Riturani as co-artistes and the music is re-arranged by Pranjal. The singer who is a teacher in Sanskrit at a government institute at Nagaon has written several articles and essays in the classical language which he feels can be understood by one and all and has more than 100 translated and original Sanskrit songs to his credit. ‘Manomohini’, ‘Mriganayana’, ‘Sagara Sangamah’, ‘Yasoda Nandana’ are some of his audio CDs which contain several hits of yester years including those of Mahapurush Sankardeva, Jyoti Prasad Agarwalla and Bishnu Prasad Rabha. In the pipeline are ‘Anandini’ and ‘Dastakakam’.